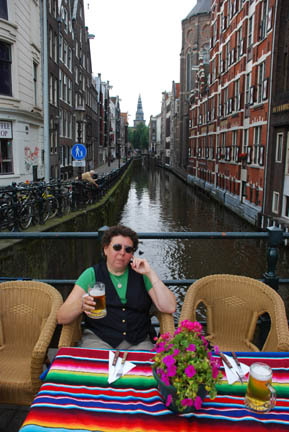 After leaving Wing Ding we headed southwest towards Holland and Amsterdam. 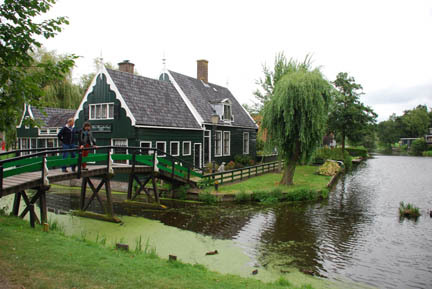 Holland is a province within the country called The Netherlands. We took two days to do it following 2-lane roads that crossed 3 rivers, two were on ferries and one tunneled under. 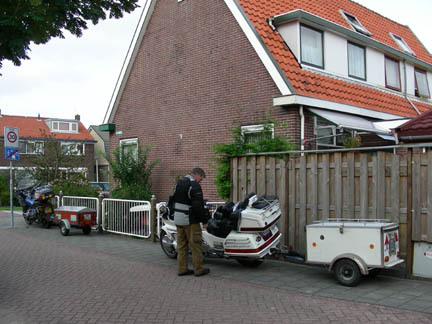 We had a campground "15 minutes from Amsterdam" marked in the GPS but when we got there we found it swamped with backpackers. We tried to pull up to the registration building but couldn't get near it for the crowd of backpackers trying to register. So we turned around and left. We had seen signs pointing to another campground on the way to this one and decided to check it out. It was a couple of miles away, but down a narrow dike-top road with two way traffic and parking along the side. This campground was crowded but not packed and we didn't know where else to go, so we stayed. And that night it rained for the first time in a week, but was dry the next day. We found out the bus came down this narrow lane and stopped near the campground. The next morning we took it into Amsterdam. 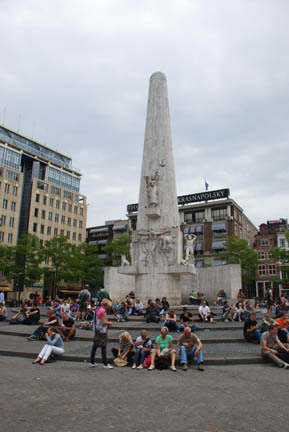 Amsterdam is the most varied city we have seen yet. 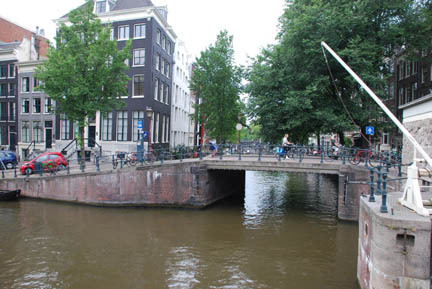 It has all the canals and bicycles you have heard about. and "Coffee Shops" that sell marijuana. 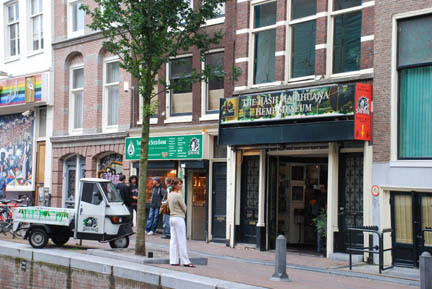 Mixed in with this are cafes and restaurants that serve almost every type of food you can think of to eat. We had lunch at a Mexican restaurant at the end of a canal. But they didn't serve any Mexican food for lunch, only dinner. We wandered around for several hours looking in shop windows and playing tourist. There were lots of young adults, many with their backpacks, in the plazas and streets. I think many of them were staying in the streets. Most of them were in their teens to twenties, but some were old enough that they looked like they were left over from the 60's. They say that if you remember the 60's then you were not really there. I believe you could say the same about Amsterdam. It is a strange city, at least downtown. We didn't get into the suburbs so we can't speak about the whole town. While at the Wing Ding we had met a Dutchman who invited us to stop by while we were in town. 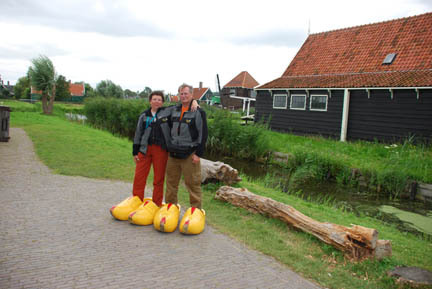 Dirk is a real genuine Dutchman, with the wooden shoes and all. He uses them as outdoor clogs and slips out of them when entering the house. In fact the shoes were so handy that I would like to have a pair to take home, just that they are too bulky. 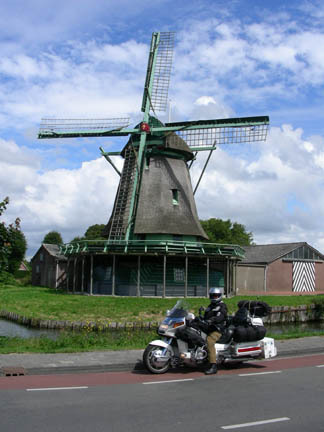 Dirk took us to a village of vintage houses and windmills that had been set up as a heritage site. 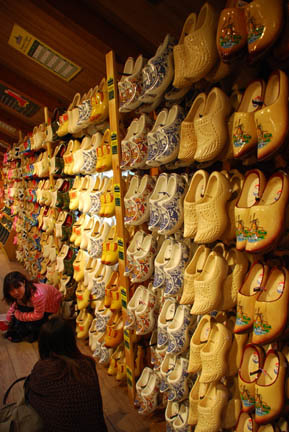 We got to try on some wooden shoes but couldn't find a place to pack them to bring them home. The heritage society had moved the houses and windmills to the site and had crafts persons doing crafts from the 17th and 18th centuries. We watched a man make pewter spoons with a hand mold and another make wooden shoes on a machine. The shoe machine worked like a key cutting machine. 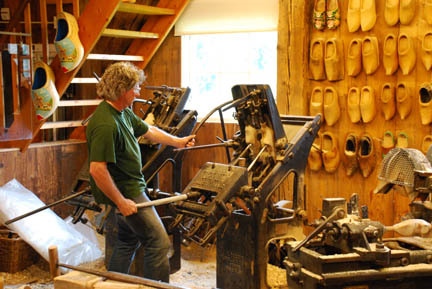 There was an already shaped shoe in a holder and the machine used it as a guide when it cut into the block of wood in the other holder. Some of the shoes are carved or painted with decoration. These were all for sale. We spent several hours at the village and had a very interesting time. 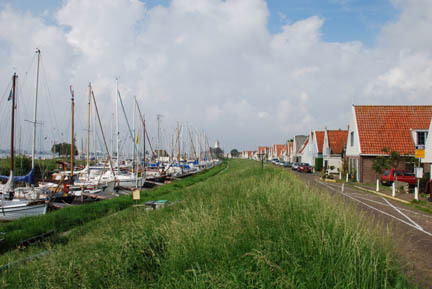 The Dutch were very clever to build the windmills, dikes and drainage to create the land for much of their country. 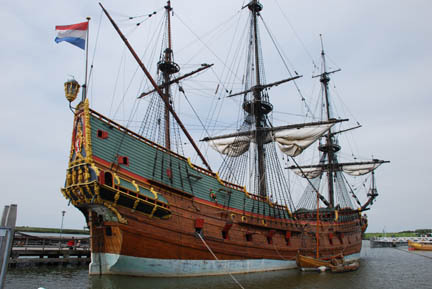 The next day he and his wife Heddy took us to the life-size replica of the Batavia, a sailing ship from the days of the Dutch East India Company. This was when the Dutch essentially owned the oceans and brought valuable spices from the orient to Europe, greatly enriching their small country. From here we're headed to the British Isles and a couple of Treffens (rallies). We plan to be there for about six weeks.